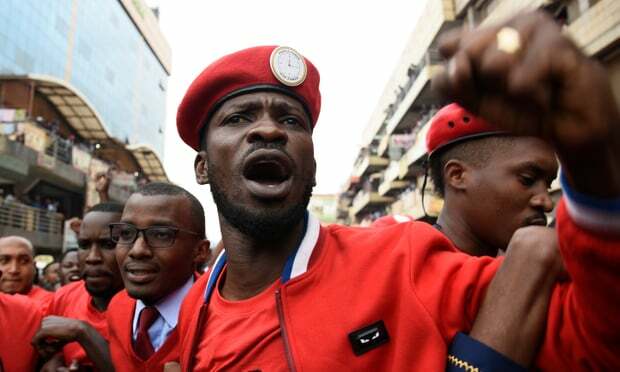 Prominent Ugandan opposition lawmaker Robert Kyagulanyi arrived in the United States over the weekend for medical treatment following accusations he was tortured while in military custody in the East African nation. Kyagulanyi, a popular musician known by his stage name Bobi Wine, was initially prevented from leaving the country. He was cleared to fly out on Friday after the government sent a team of nine doctors to examine him. Bobi and 32 opposition militants were charged with treason last week over the alleged stoning of President Yoweri Museveni’s convoy. Bobi Wine was arrested on August 13 after an electoral campaign rally in the north-western town of Arua where the presidential convoy was allegedly stoned. His driver had been shot dead by police, according to local media. The musician was initially to be tried in a military court over accusations of unlawful possession of firearms but the charge was dropped. A civilian court, however, charged him with treason. He was freed on bail on August 27. Global musicians, including Chris Martin, Angelique Kidjo, Chrissie Hynde and Brian Eno last week issued an open letter condemning the treatment of Bobi Wine. The musician’s legal team says he suffered multiple fractures and injuries while in detention. The Afrobeats star has been a thorn in the side of Museveni’s government since his election to Parliament last year. He has emerged as a formidable threat to the president. Museveni, a key US security ally, has been elected five times. The last vote in 2016 was marred by allegations of fraud. Posted by Steven Addamah on September 3, 2018. Filed under Lifestyle. You can follow any responses to this entry through the RSS 2.0. Both comments and pings are currently closed.